Conveniently located "on the hill" in Oyster Bay, our facilities expand over 46-acres and offer rain or shine accommodations: two gymnasiums, a theater stage, dance studio, art studio, woodworking shop, cooking facilities, air-conditioned lunch room, science and computer labs, library, athletic fields, two pools, an Early Childhood wing, and two playgrounds. 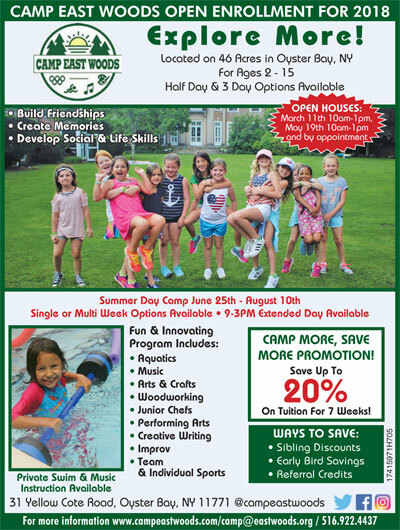 Through various outdoor activities held on our campus, as well as indoor skill-based programs held within the walls of the historic East Woods school, campers engage various modes of extraordinary exploration, participating in new and familiar activities with their friends. At Camp East Woods, we provide our campers with the ideal setting to "explore more". Camp East Woods is the summer home that your children won’t forget. For more program information, innovative program offerings, and dates and rates, visit www.campeastwoods.com. Join us for an open house on March 11 or May 19 from 10am-1pm, and by appointment.